t*rexes and tiaras: Friday Favourites 274.. Isn't it funny how as soon as Easter is out of the way, people start talking about holidays and jetting off to sunnier climes. If only! 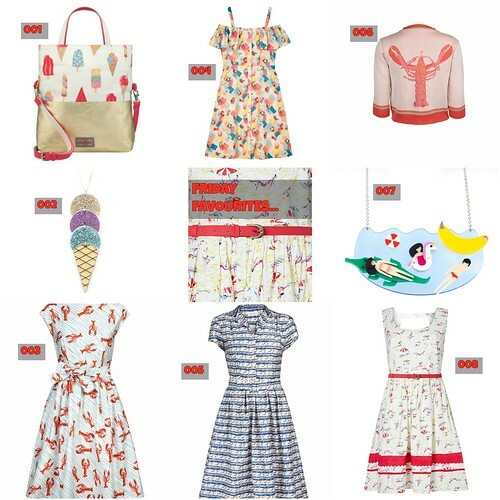 But, whilst I may not be going on a holiday this year, it doesn't stop me thinking about holidays and enjoying all of the holiday themed prints which seem to be hitting the shelves lately..
Lobsters, swimmers and ice creams, oh my! Clearly sunbather prints are currently all the rage, as I also have about three different sunbather print fabrics bookmarked at the moment. But here's my pick of the beach prints from the high street for now. My Cath Kidston wishlist is long at the moment, and this ice cream bag (001) would be perfect for toting my seaside essentials about. The sunbather print dress (004) is pretty cute with it's shoulder cut-outs and the button detail to the front, but I think I'd need to see it in person as I have a feeling it might be rather short. 007: This Little Moose necklace is still one of my favourites of their current offerings; I'm fairly sure I've mentioned it before. Also this glittery ice cream necklace is pretty awesome, too (002).